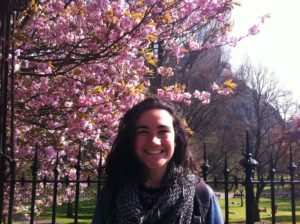 Adela Briansó was born and raised in Spain and is currently in her final year of Social Anthropology and Politics at the University of Edinburgh. Based in ethnographic research, she carried out a research project on the experience of breast cancer in Spain. Through this project, Adela explored health and illness and became interested in the links between social structures and public health. She would like to pursue a career in social research as a tool for improving public health systems. Her not-so-secret dream is to become a trapeze artist. In October 2015, the Massachusetts’s police force used pink handcuffs for breast cancer awareness. The same year, the White House turned pink. Every October, cereal boxes feature pink ribbons, and celebrities wear pink for the cause. While pink ribbons flood the city, it is okay to be sceptical. Let me introduce you to the dangerous women who question ‘pinkification’. I met a dangerous woman this summer. Maria is a nurse and she has a twenty three year old daughter. Because of breast cancer, she had a double mastectomy: she lost both of her breasts to a surgical operation. “I’m fed up of pink ribbons everywhere”, Maria told me. Now, I was a little shocked: I had never questioned the good intentions behind the symbol representing solidarity towards breast cancer patients. “It makes me feel like I’m just one more, it labels me as ‘a woman with breast cancer’ ”, she continued. Breast cancer is a disease that affects one in eight women in the UK. Although it is one the types of cancer with highest survival rates, it still causes thousands of deaths every year. Over 95% of breast cancer patients are women. Audre Lorde, an iconic feminist who had breast cancer, loudly fought against narrowing the disease to a single account, determined to give a voice to the “many silences to be broken”. The truth is that a lot has been written on breast cancer since then. But most of it speaks of one particular kind of experience. I would like to contribute to Lorde’s plea by introducing you to the pink-sceptic women. Early detection has a major impact in increasing the chances for survival, making breast cancer prevention crucial in lowering mortality. But Maria scepticism got me thinking: what is the symbol of lung cancer? Or liver, or throat, or skin cancer? Or the icon of other tough, chronic pathologies like diabetes, or Crohn’s disease? Why is the breast cancer’s pink ribbon overwhelmingly more visible than any other symbol? Breast cancer campaigns are soft and pink, and preach optimistic messages of support and solidarity. All year round, pink floods takes over the city, from cereal boxes to pink-died fountains. It was Charlotte Haley who created the symbol as a way of pressuring the government to increase cancer research funding in 1990. Soon adopted by the magazine Self, the pink ribbon campaign spread globally, achieving undeniable benefits in raising awareness and fundraising. But the pink ribbon culture has also become a business: a hidden, profitable and marketable one. First, secretive profiting. Often, the final destination of the big fundraising campaigns is unclear. Often, big pink ribbons decorate products where a minimal percentage is dedicated to research. Often, big corporations make use and abuse of the delicate, feminine look of the pink ribbons. At the end of the day, who would say no to increasing hope in the fight against breast cancer? Unfortunately, the cause is not always good. A worrying number of the companies embracing pink awareness sell products that have been proved to be carcinogenic, yet dare to use pink ribbons as a marketing strategy. Cosmetics, deodorants, automotive industry… the list goes on. Women like Maria are dangerous because they question the immaculate pink, the harmless symbol. They point out hypocrisy, and pose an obstacle to maximisation of profit. Second, social media. Good intentions are likely to lie behind changing one’s profile picture to a pink ribbon. But for those who have been through cancer directly or indirectly, being digitally bombarded with pink ribbons can be difficult. It might be a ‘first world problem’, but it affects real people. In the case of breast cancer, it mostly affects real women. “It annoys me when all my contacts set pink ribbons as their picture. It’s a constant reminder of something that has passed, and I don’t see its purpose”, said Maria. The purpose is, of course, awareness. But the tangible impact of Facebook likes is questionable. Third, massification. Without a doubt, the massification of the pink ribbon has informed thousands about breast cancer. But the meaning of the symbol has changed on the way, simplifying a very complex and individual experience to a single narrative: a pink universe of hope and heroism, loss and trauma. Pink ribbons personify breast cancer like a single evil enemy. Often, pinkification dismisses the complexity of the illness experience, and ignores social, political and economic factors overarching it. While it is positive change to de-stigmatise breast cancer, the pink ribbons are overused, and risk a complete loss of meaning. Women like Maria cringe with every pink ribbon advertisement, refuse to buy carcinogenic cosmetics and do not believe that driving a BMW will help beat breast cancer. Doctors, patients, sisters, mothers: these women are taking action, loudly rejecting being narrowed to ‘women with breast cancer’. They are dangerous to the profitable pink universe of the breast cancer industry. Lorde, A. (1995) The cancer journals: The original edition. 2nd edn. San Francisco: Aunt Lute Books, .